Photography as the name implies simply means the science , art , applying and practice of creating lasting images by recording light or other electromagnetic radiation , either electronically by means of an image sensor. With the above definition of photography, lets go into the deal of the day. When you hear the word Photography, what comes to your mind ? Are you a Photo Freak? Or You love taking pictures? Then you need to read this till the end. Who Is Next? 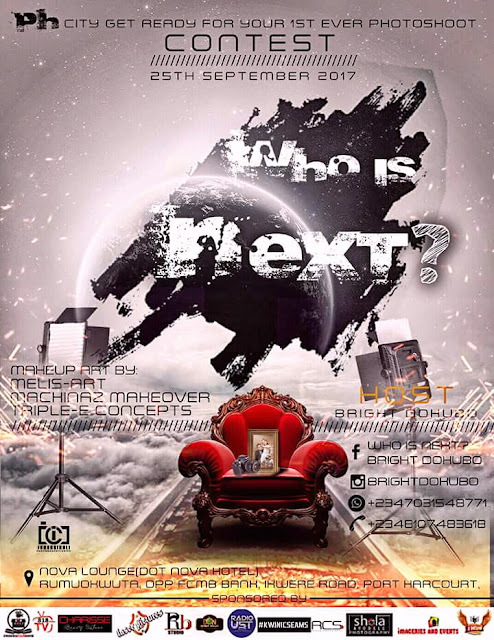 Is a contest held by a professional photographer based in Nigeria, in the city of Port Harcourt precisely. Bright Dokubo who professional ventured into photography five years ago, with his love for photography he decided to hold a photo contest for those who love pictures. Bright Dokubo speaking on his reasons for organizing this contest said "i want to give back to the society, organizing this photo contest is the only way to do it". The first step in joining the Who Is Next? Contest is getting the form which is sold at N2,500 only! Third Price - Free Photo Shoot For 3Months. The best thing about this photo shoot is that everyone get to go home with their photos, that means it's almost free! With over 50 pictures for each contestant. For more info call 08107483618 or Whatsapp 07031548771. Sponsored by Eminence Film House | 818TVonline | Laser Pictures | Dot Nova Lounge | RB Studios | Imageries And Events.